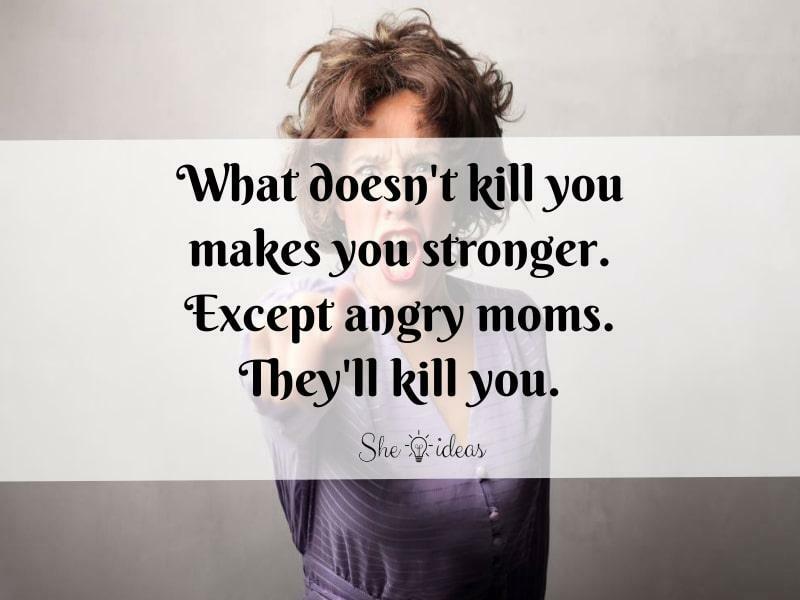 Moms are amazing, there’s no doubt about it, but there’s something about the angry mom meme and how funny it is to see a mom suddenly mad about stupid things that we can’t simply ignore. I mean, let’s be honest. 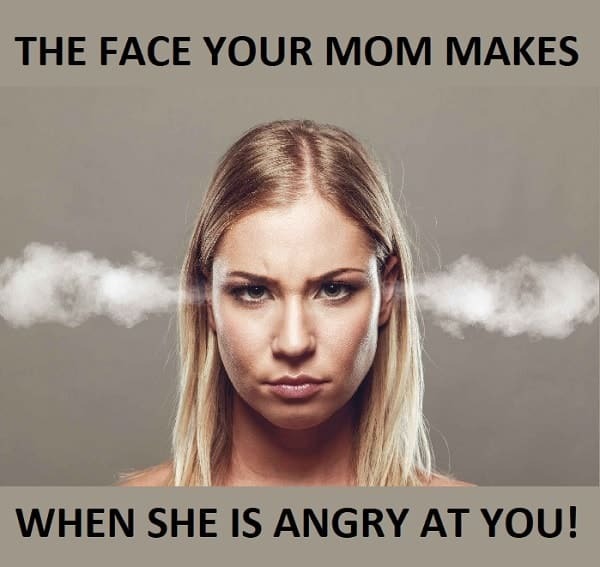 Moms are usually the sweetest people on earth, they are nice and kind to everyone, but also, they can get really mad really fast, and these angry mom meme compilations are a great example of that. They literally get mad about the stupidest things. Did you leave a fork on the sink? They get mad, you didn’t make your bed before you went out? Oops, they got mad again! 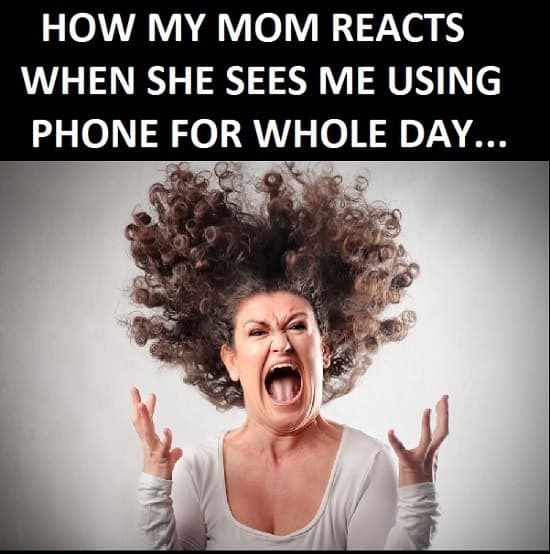 Honestly, moms get mad about almost everything, which makes the angry mom meme even funnier. 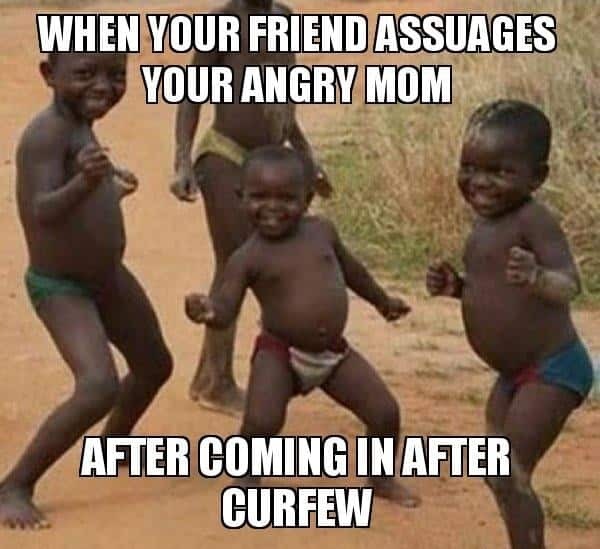 So, get ready to enjoy one of those classic memes that simply never go out of style, and if you are a mom reading this, well… We are sorry, but this was too funny to simply let it pass! 1. 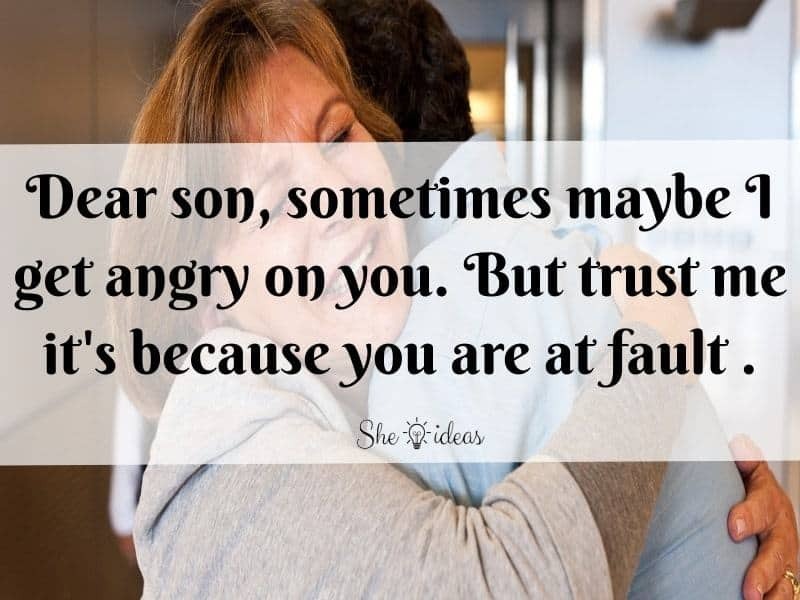 Dear Son, Sometimes Maybe I Get Angry On You. But Trust Me It’s Because You Are At Fault. 2. 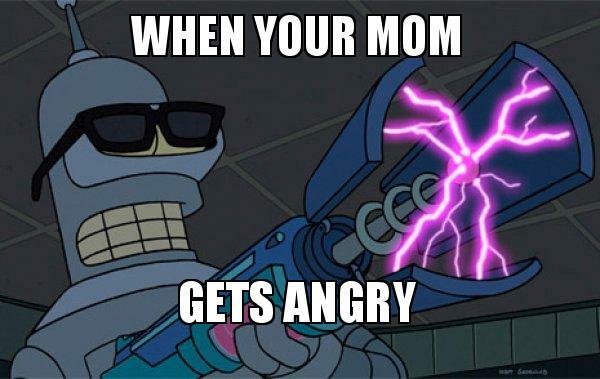 Angry Mom! 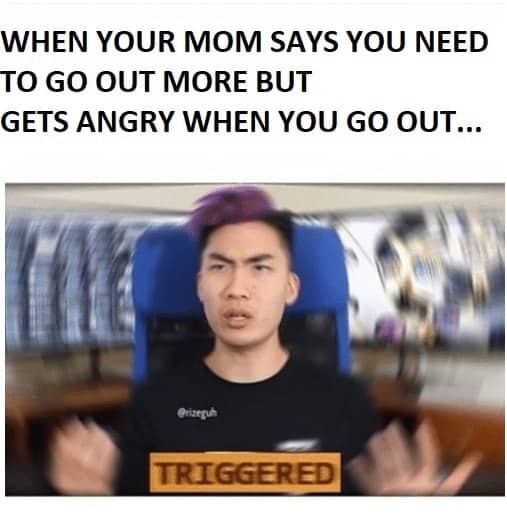 Go To Your Room, Right Now!!! 3. Brace Yourselves. 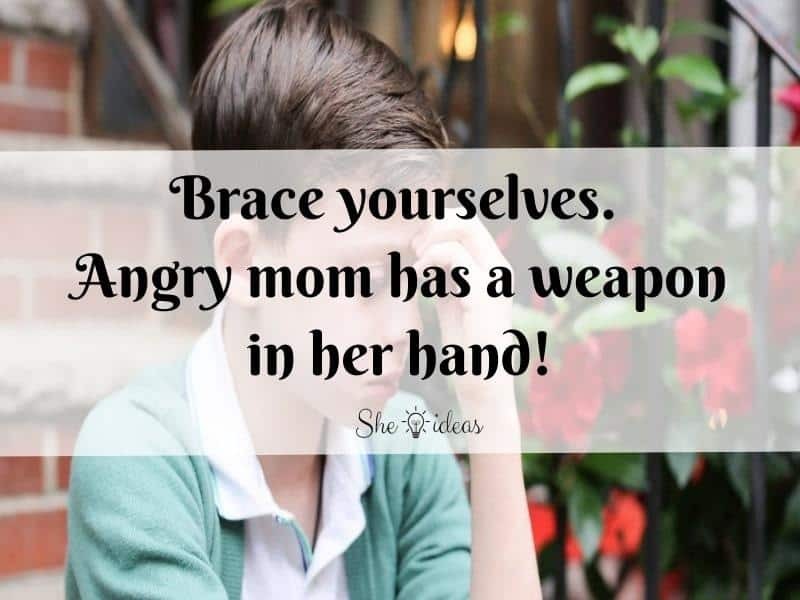 Angry Mom Has A Weapon In Her Hand! 4. My Angry Mom Said, I’m Like You. She Offended Me! 5. What Doesn’t Kill You Makes You Stronger. 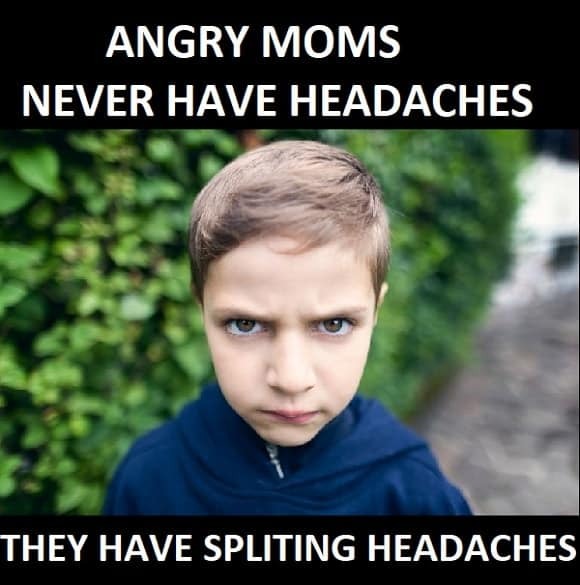 Except Angry Moms. They’ll Kill You. 7. 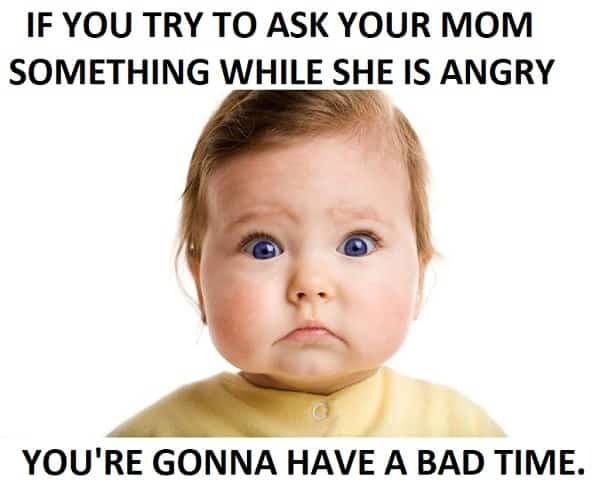 If You Try To Ask Your Mom Something While She Is Angry You’re Gonna Have A Bad Time. 8. 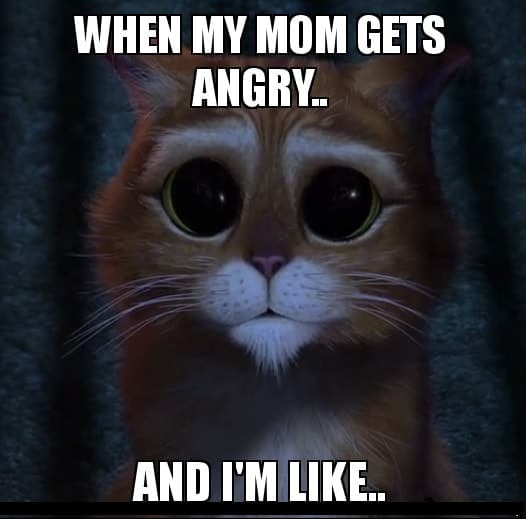 The Face Your Mom Makes When She Is Angry At You! 9. Complete The Homework Right Now. 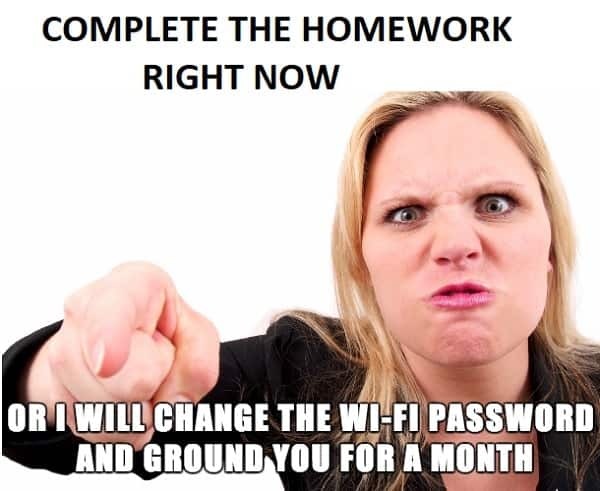 Or I Will Change The Wi-fi Password And Ground You for A Month. 12. When Your Friend Assuages Your Angry Mom After Coming in After Curfew. 13. 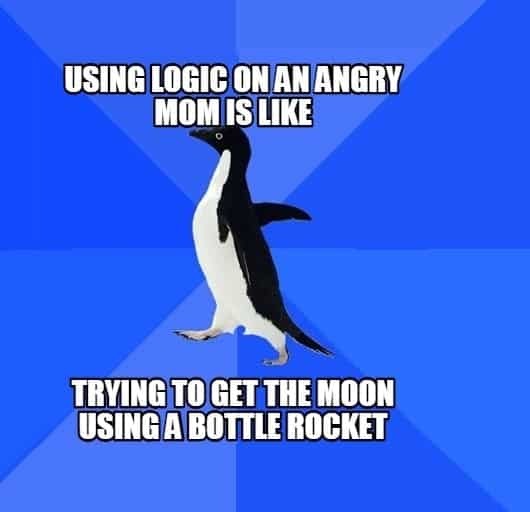 Using Logic on An Angry Mom Is Like Trying to Get The Moon Using A Bottle Rocket. 14. 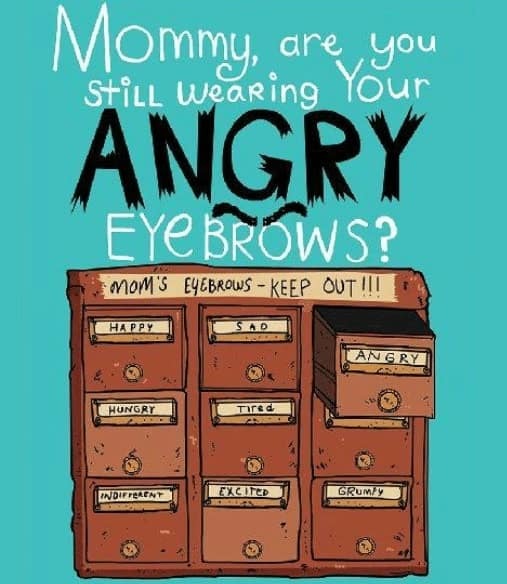 Mommy, Are You Still Wearing Your Angry Eye Brows? 15. 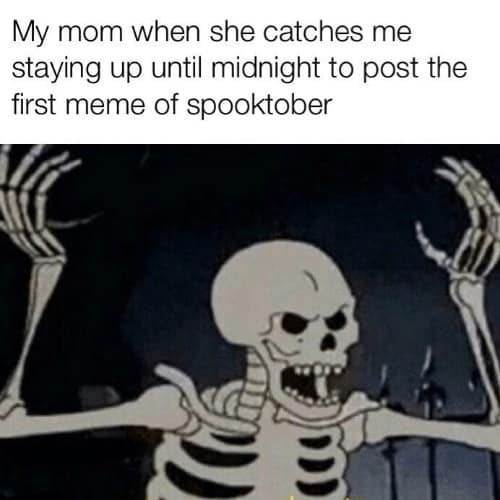 My Mom When She Catches Me Staying Up Until Midnight to Post The First Meme of Spooktober. 17. Brace Yourself. 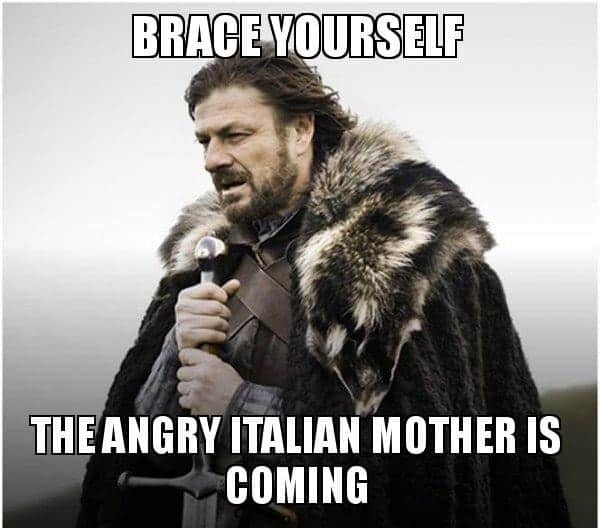 The Angry Italian Mother Is Coming. 18. Mom Gets Angry For Not Putting The Right Thing At The Right Place. 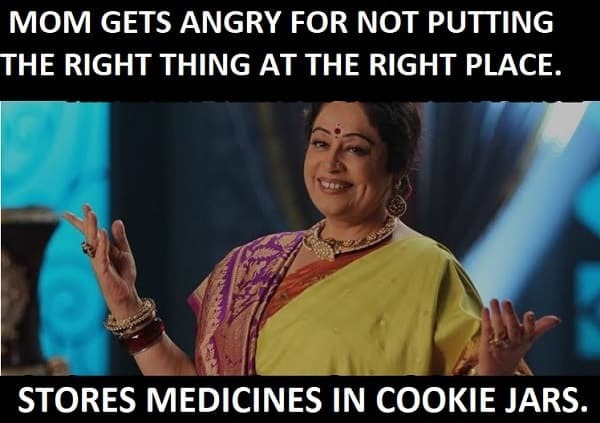 Stores Medicines At Cookie Jars. 19. 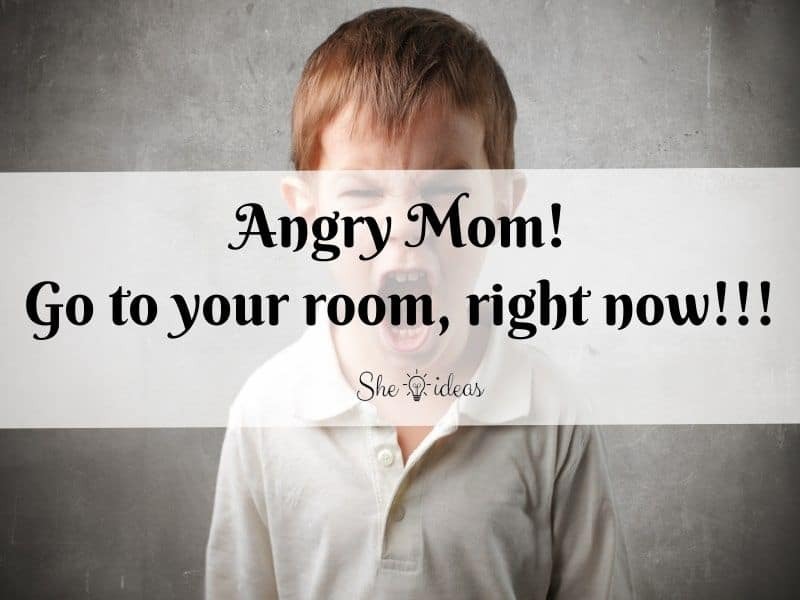 When You Mom Gets Angry! 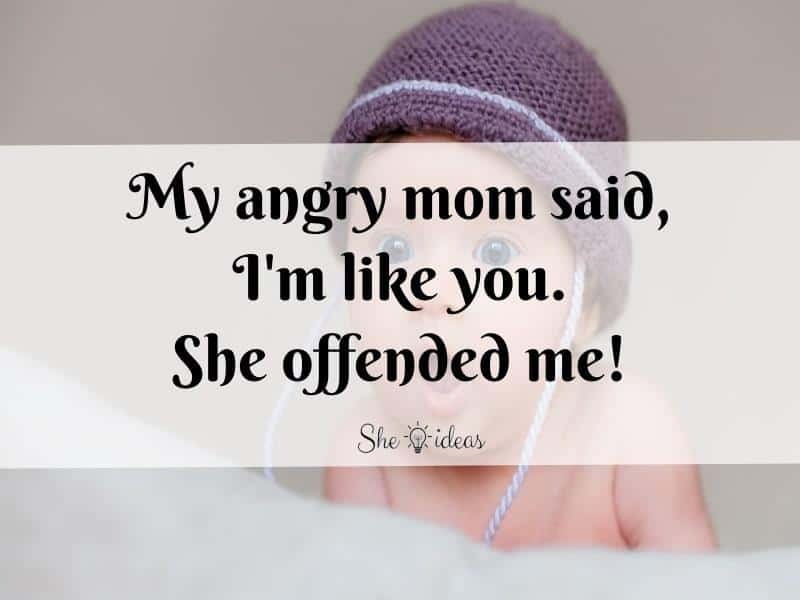 Now that you have seen the very best angry mom meme, I think we all can agree there’s nothing funnier than seeing moms get mad about simple stuff (as long as they are not our moms, and they aren’t actually mad at us). So, if you liked our compilation, make sure to share it with your friends! 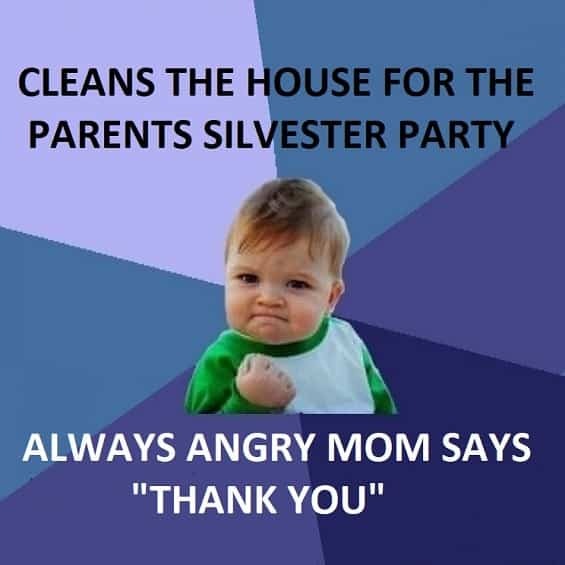 Or, if you are really daring, share it with your own mom, show these memes to her and find out if she liked it or not. And of course, remember to check out our other memes as well. We have a lot of them for you to look at and have a good time, we guarantee you, you won’t stop laughing!